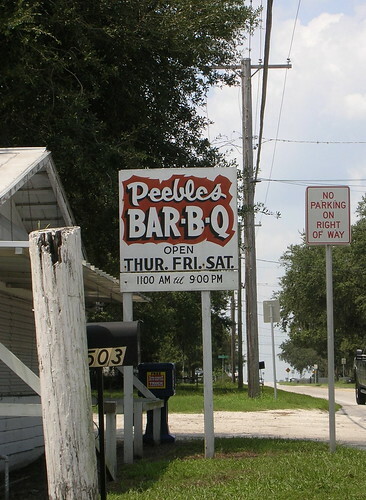 Peebles is hands down a Florida BBQ Landmark. It should be, as it's been putting out good barbecue now for more than 50 years! They are only open from Labor Day till Memorial Day and then only on Thursday/Friday/Saturday from 11am till 9pm. Nice schedule, eh? Oh - and trust me, they're packed in so tight during their "season" that you're nearly always waiting in line for a seat. Screen walls, cement floor, and a wood pile that can sometimes look more like a "heap" rather than a "pile," this place is a MUST for any true BBQ historians out there. The smoke pits are in the restaurant, so count on smelling like BBQ the whole day. 'Course - you have to go "outside" if you need to hit the bathrooms. Classic! The ribs are phenomenal - cooked more in the sometimes higher heat - fast paced - Carolina style than the true low and slow method. But where I think Peebles really shines is with their chopped pork. Folks, it's beyond description. The sweet smokey flavor mixed with a few nice texture pieces of bark are just what this boy likes to chomp on when he sits down for good 'cue! Growing up in Central Florida in the 70's, I've eaten at Peeble's many times. My parents had friends who lived within walking distance from the place. The last time I had the food was probably ~15 years go. The description above brings back so many memories as that is exactly how I remember it. Peeble's was the BBQ standard back then. Glad to hear it's still in operation and hope it's as good as I remember it. The original post is several years old but worth reviving. Peeble's is still there and still the best "old school" BBQ in Polk County. You'll be hard pressed to find anything as good for miles around.